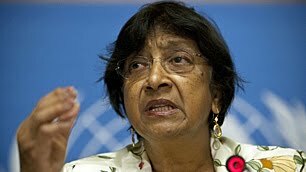 As she had in August, U.N. High Commissioner for Human Rights Navanethem Pillay yesterday urged referral to the ICC of the situation in Syria, where, according to U.N. estimates, more than 4,000 people have died since a government crackdown on protests that erupted as part of this year's Arab Spring. mandated by this Council to ensure full accountability concluded that crimes against humanity may have been committed in Syria. At that time, I encouraged the Security Council to refer the situation in Syria to the International Criminal Court. The Commission’s report reinforces that the need for international accountability has even greater urgency today. condemned the continued widespread, systematic and gross violations of human rights and fundamental freedoms by the Syrian authorities. The Human Rights Council recommended that the main bodies of the United Nations urgently consider the report of the Commission of Inquiry and take appropriate action. It called upon the Syrian authorities to fully cooperate with the Office of the High Commissioner, including through the establishment of a field presence in the Syrian Arab Republic. It decided to establish a mandate of a Special Rapporteur on the situation of human rights in the Syrian Arab Republic ... and called upon the Syrian Government to cooperate fully with the Special Rapporteur. It did not, however, recommend that the Security Council refer the matter to the ICC.